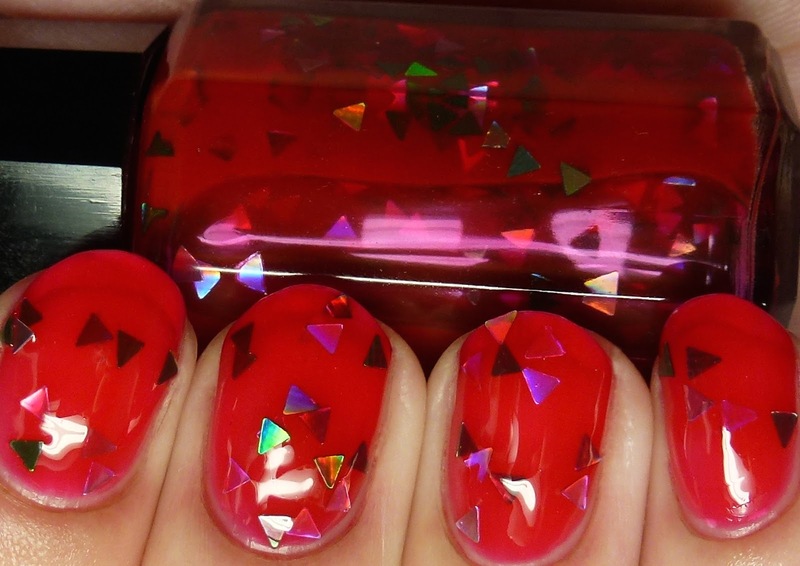 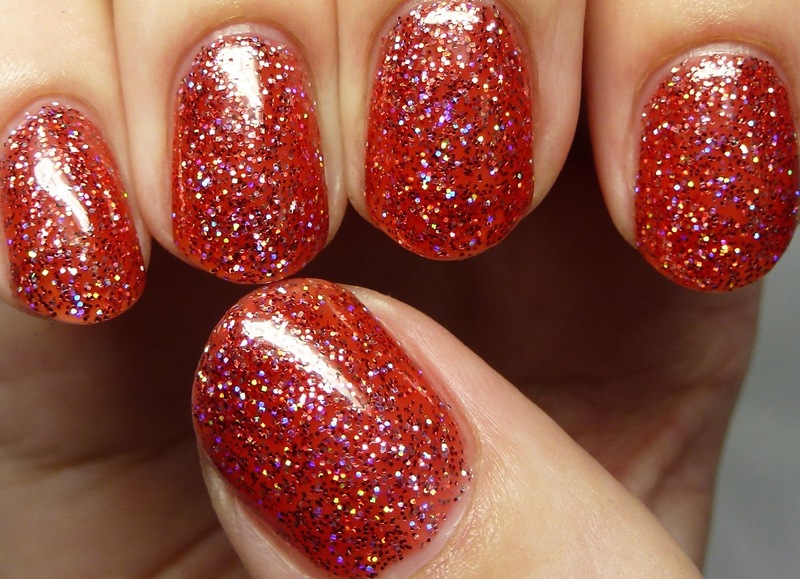 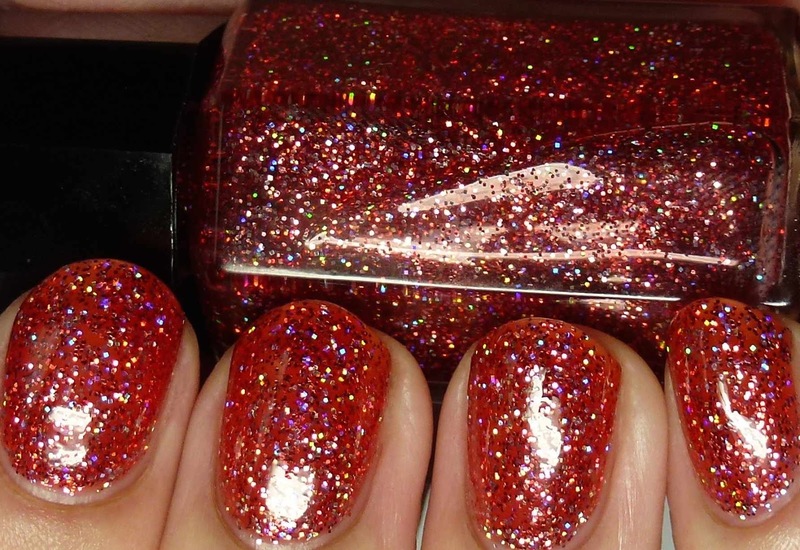 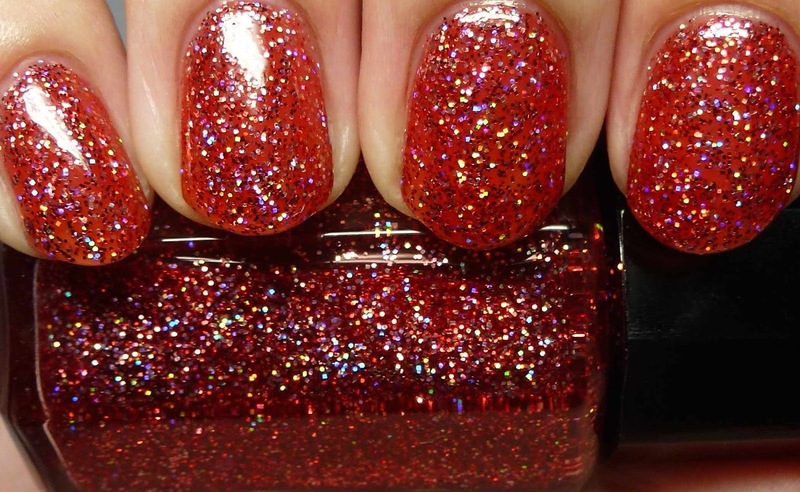 Candy Cane Coma has two varieties of ultra-sparkly holo microglitter in a a sheer orangy red jelly base. 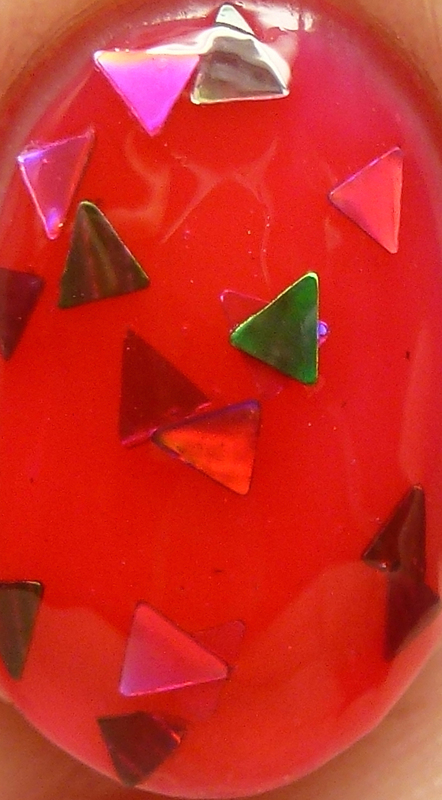 If you check out the macro shot below you will see that some are hexes and some are squares. 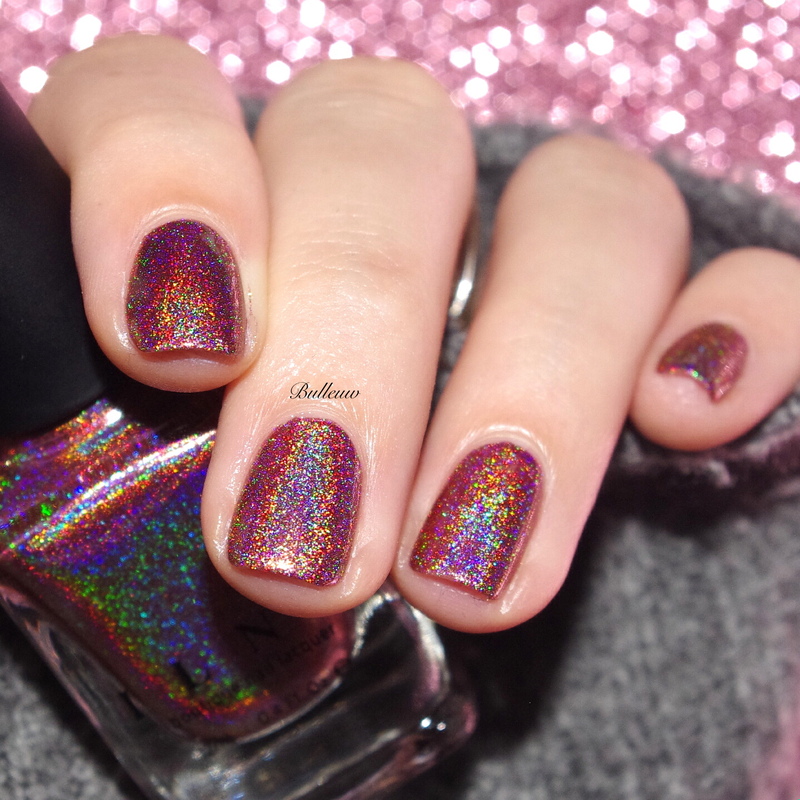 OMG, square holo microglitter, haha! 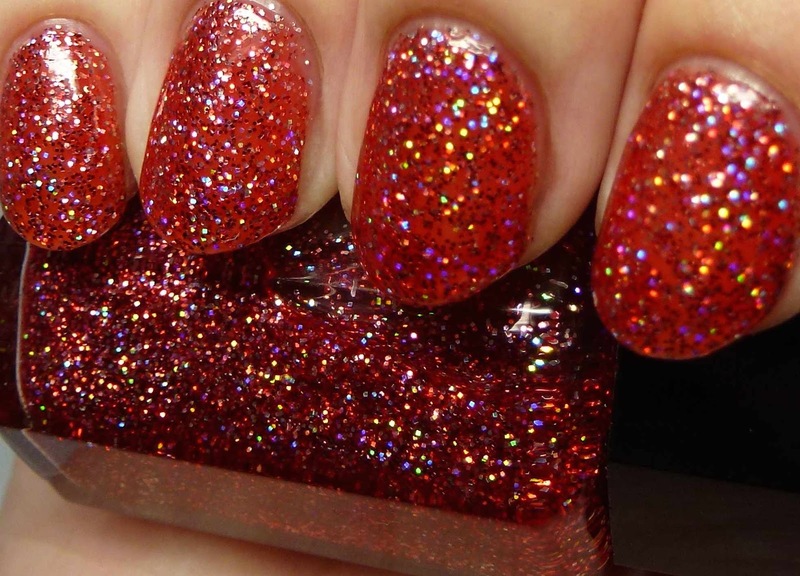 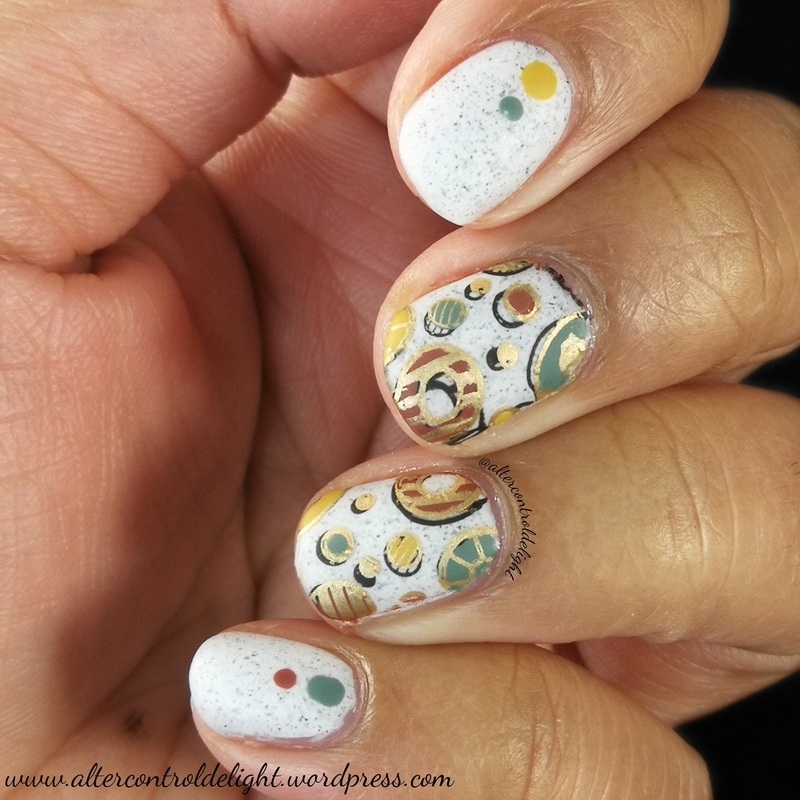 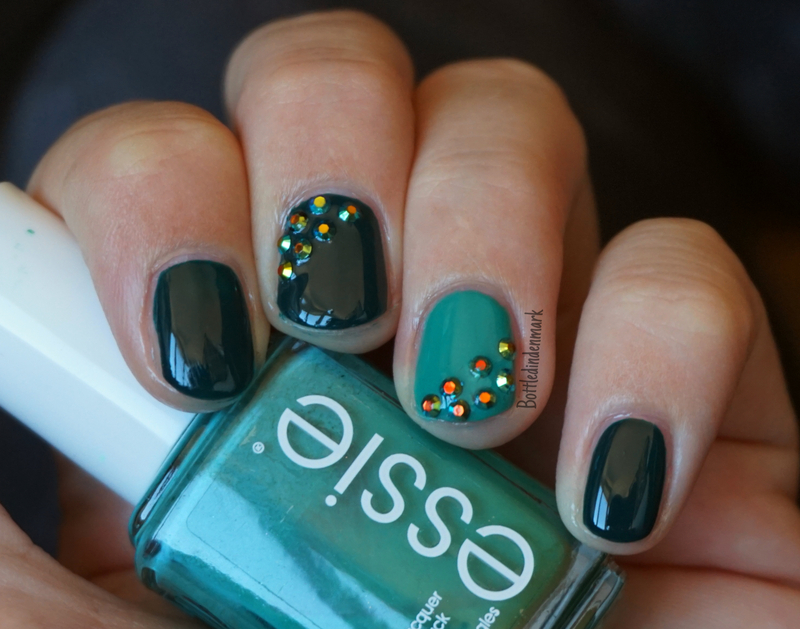 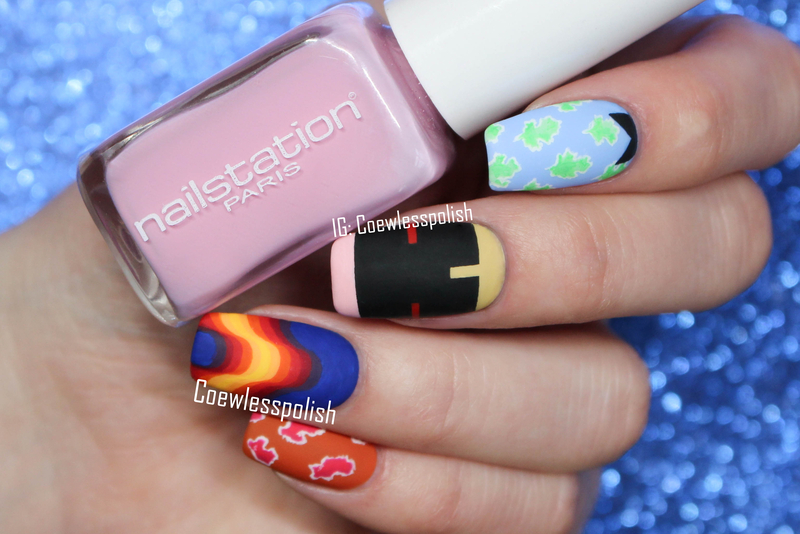 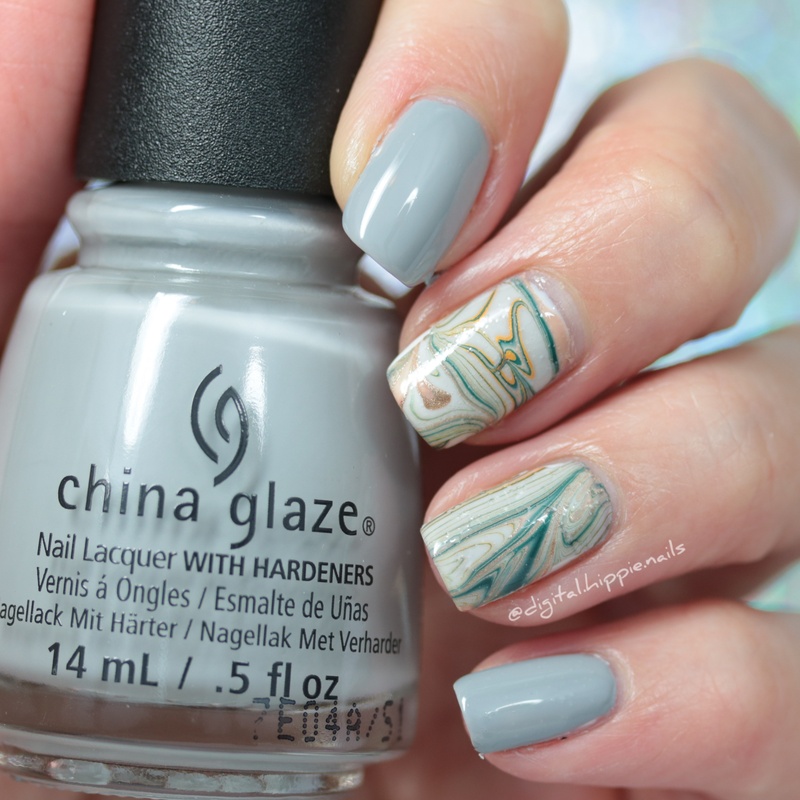 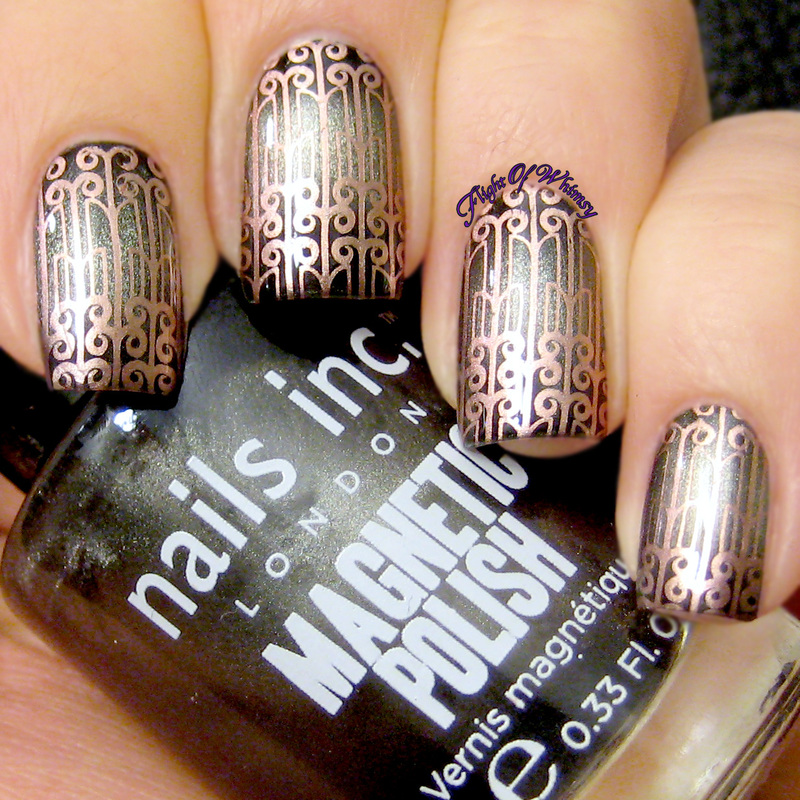 This would work as a topper or a full mani. 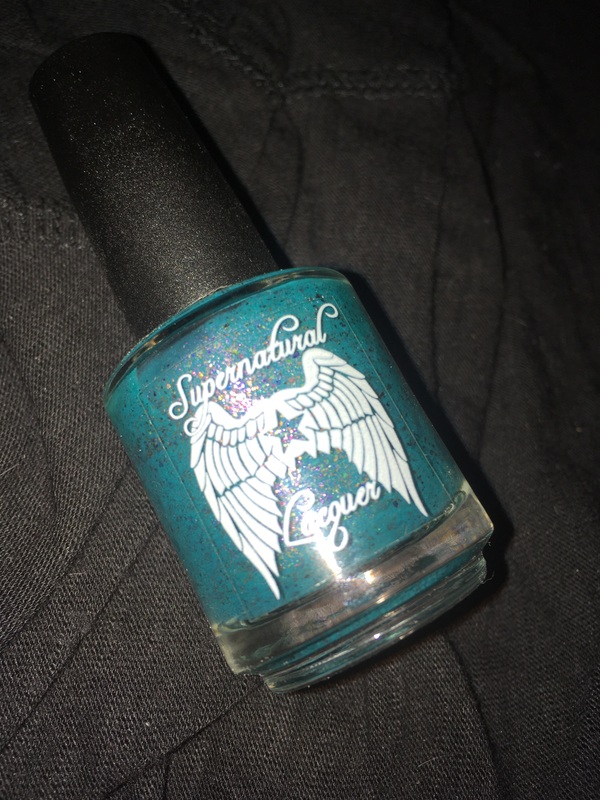 Here I am wearing it with four coats and top coat and there is only a wee bit of nail line visible and it dries fairly smooth. 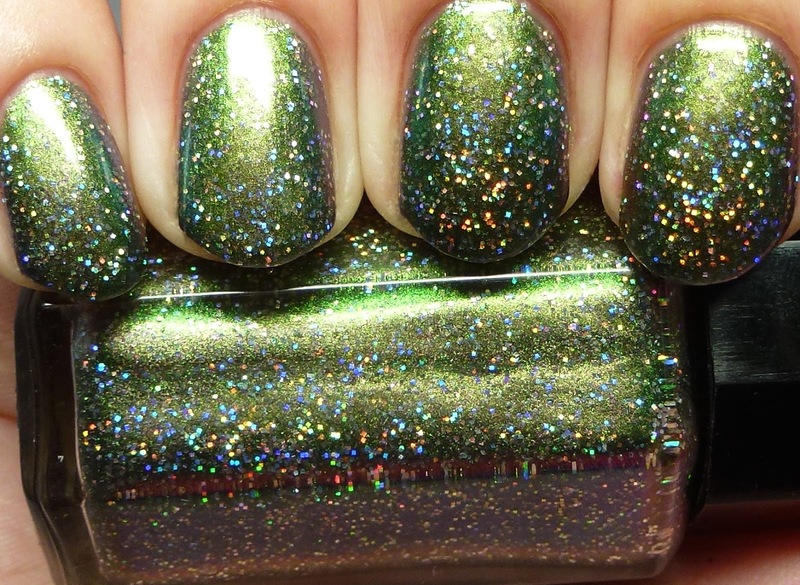 Elfish was one of my two favorites from the collection. 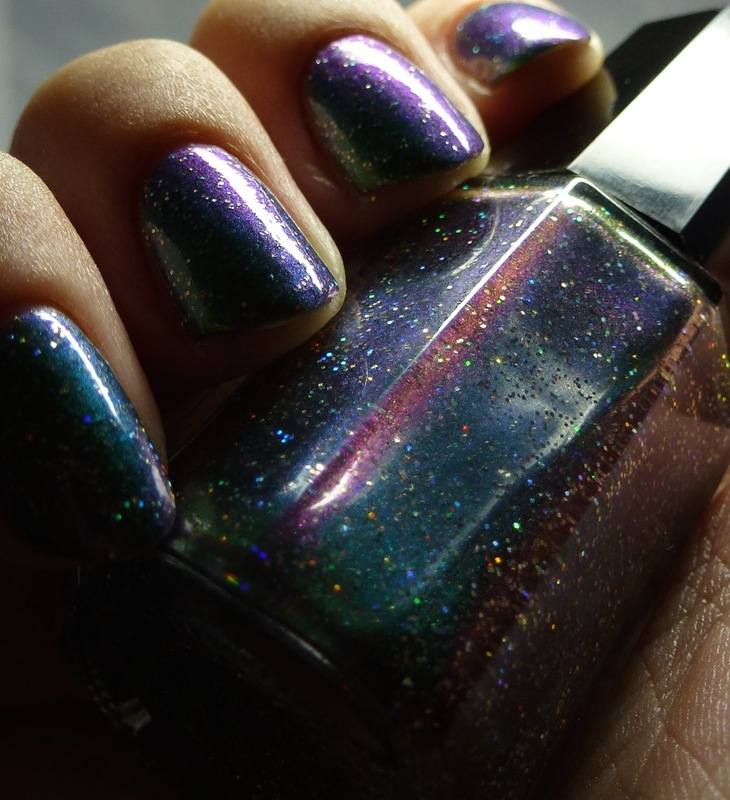 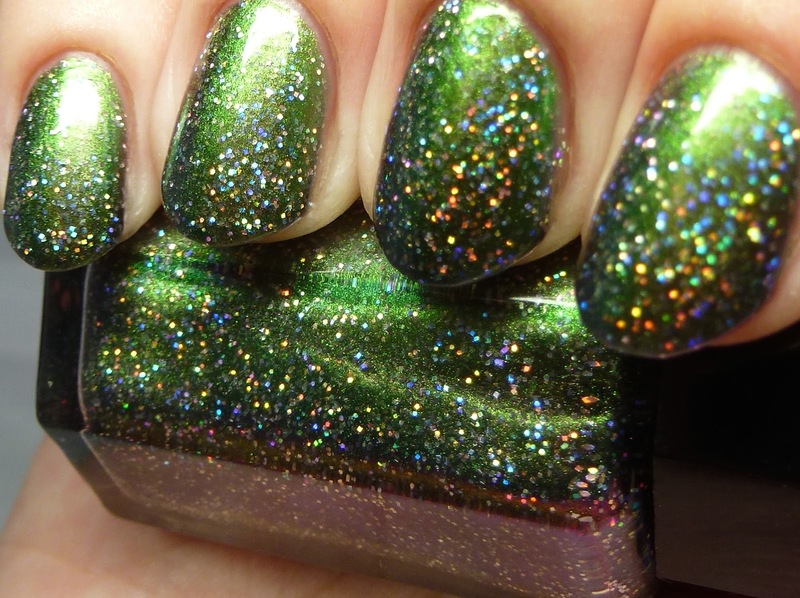 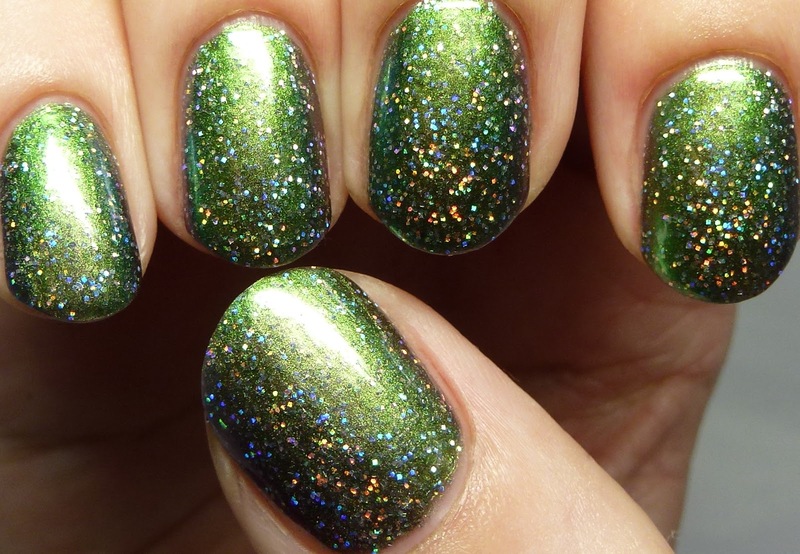 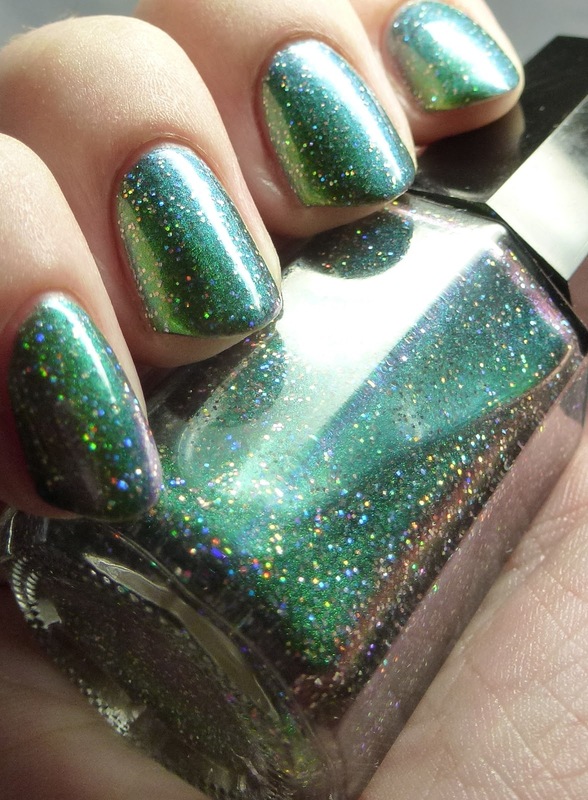 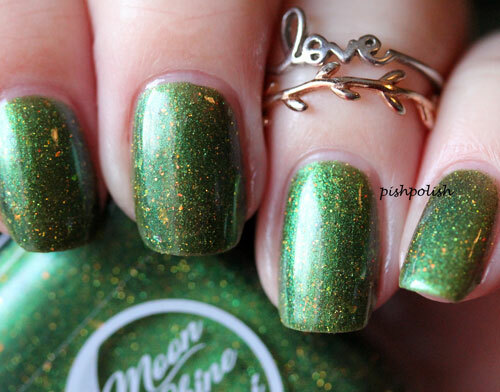 This has the same holographic microglitter as Candy Cane Coma but in a strong green-to-purple shimmery multichrome base. 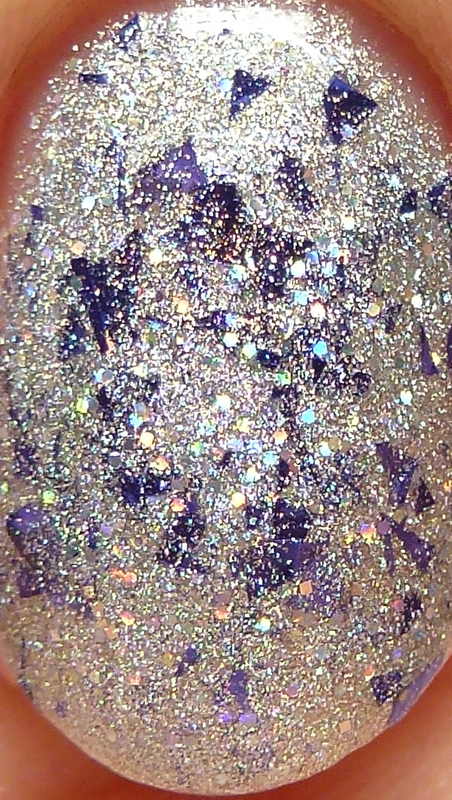 The base is sheer enough to allow many layers of the glitters to show through but it's still opaque. 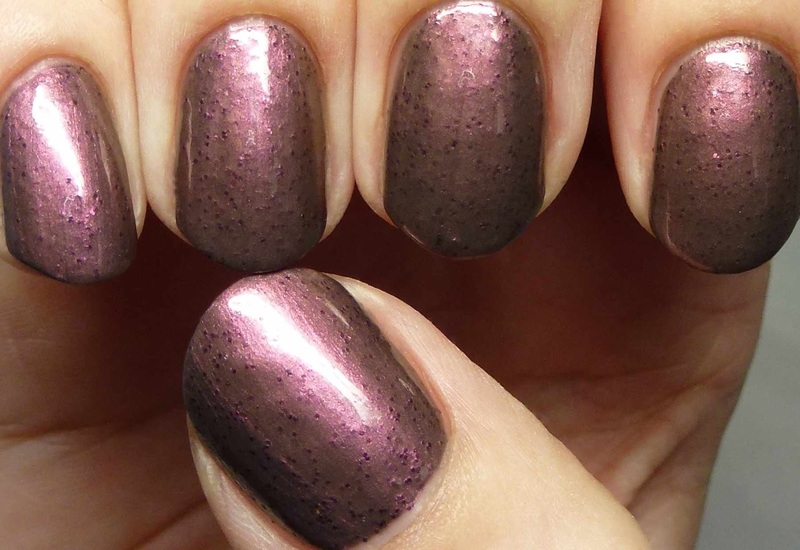 This is four ultra-thin coats and it dries fairly smooth. 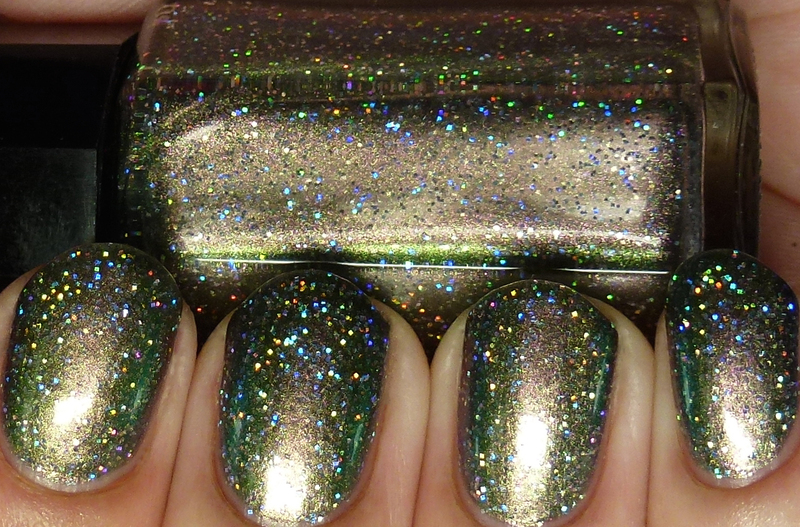 I included more pics than usual because I could not get over how beautiful this is! 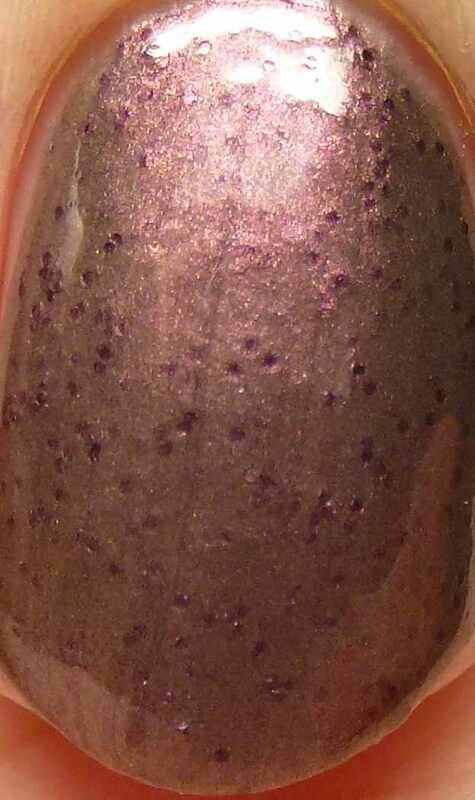 Figgy Pudding has deep plum microglitters in a mauve taupe shimmer/frost base. 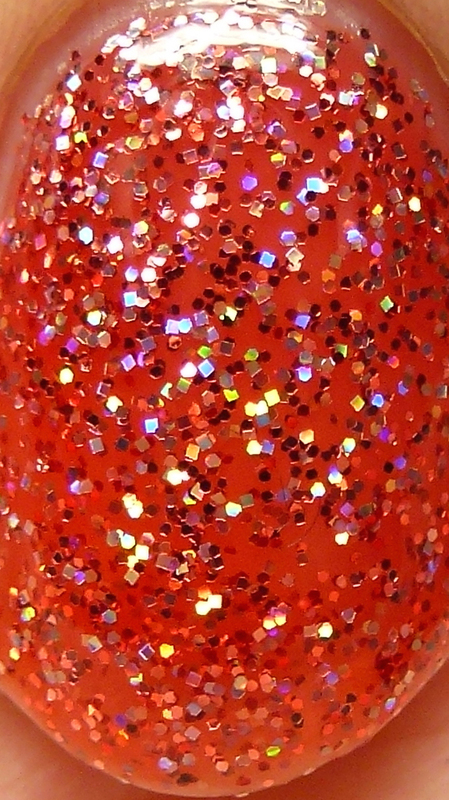 This one has just enough translucency to allow the glitters to show through and is smooth. 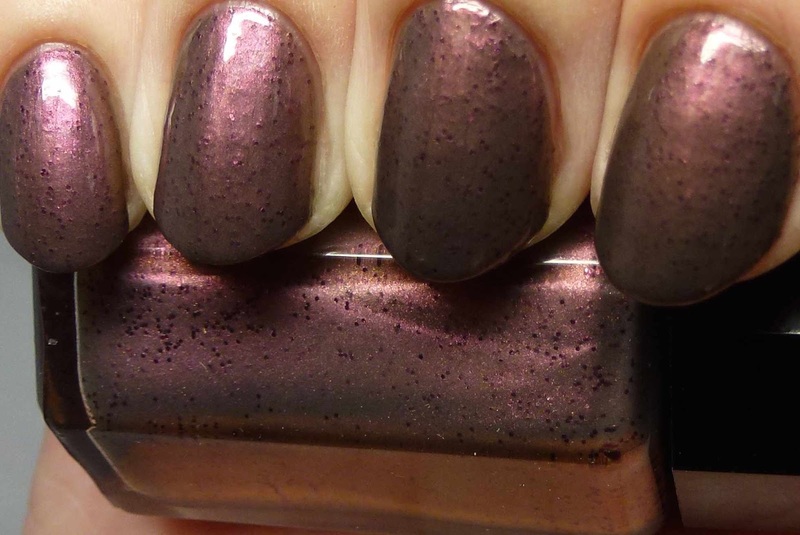 I love how the base appears almost smoky gray at the edges. 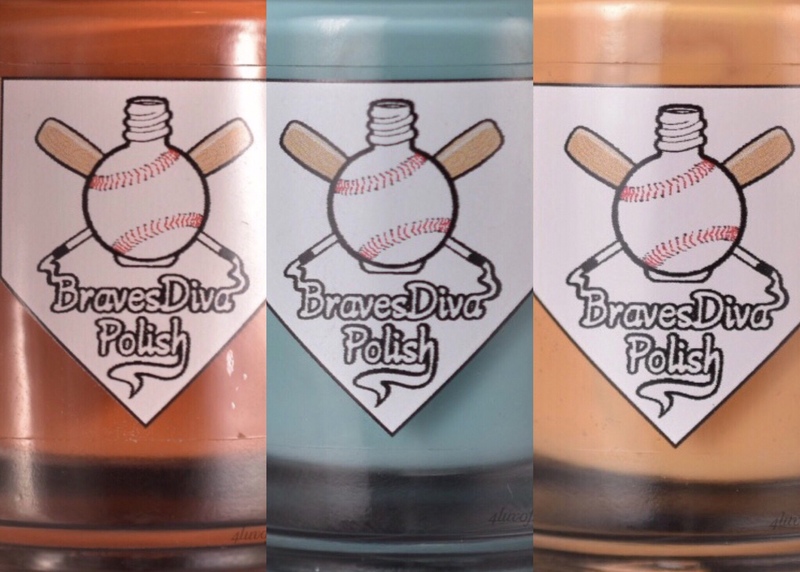 Four thin coats. 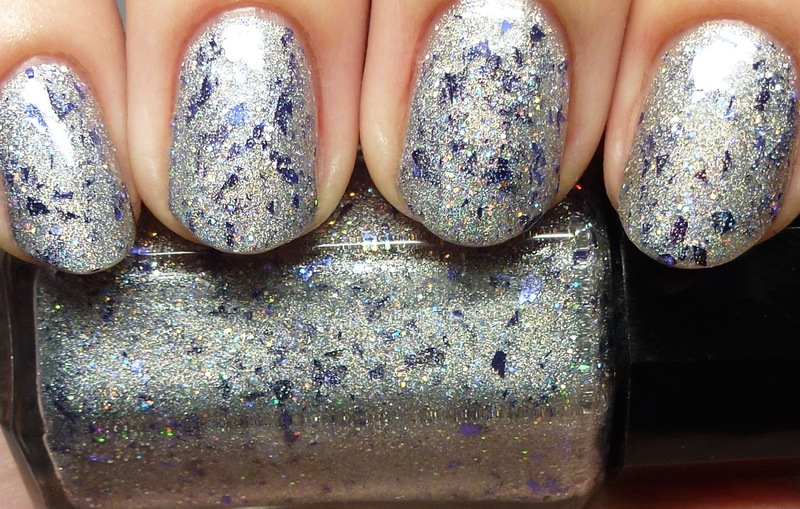 Snow Miser brings me back to my childhood and is named for a character in the 1970s Christmas special, A Year Without a Santa Claus. 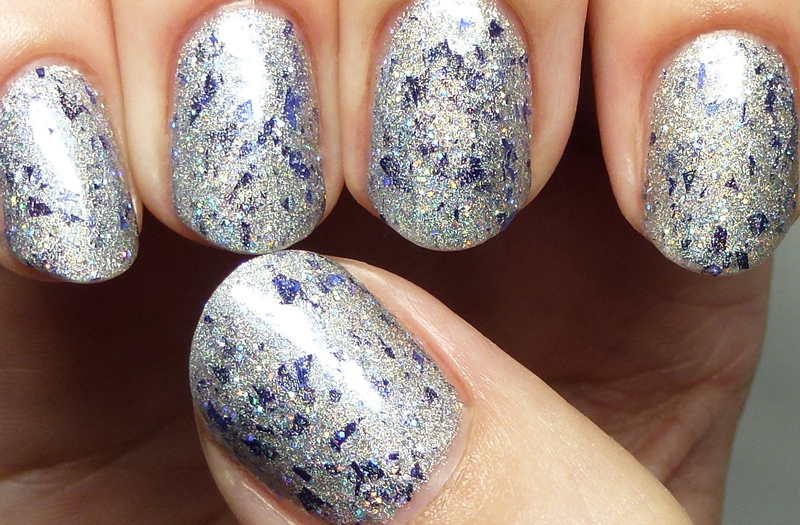 This was my other favorite among the glitters as it is so delicate and sparkly. 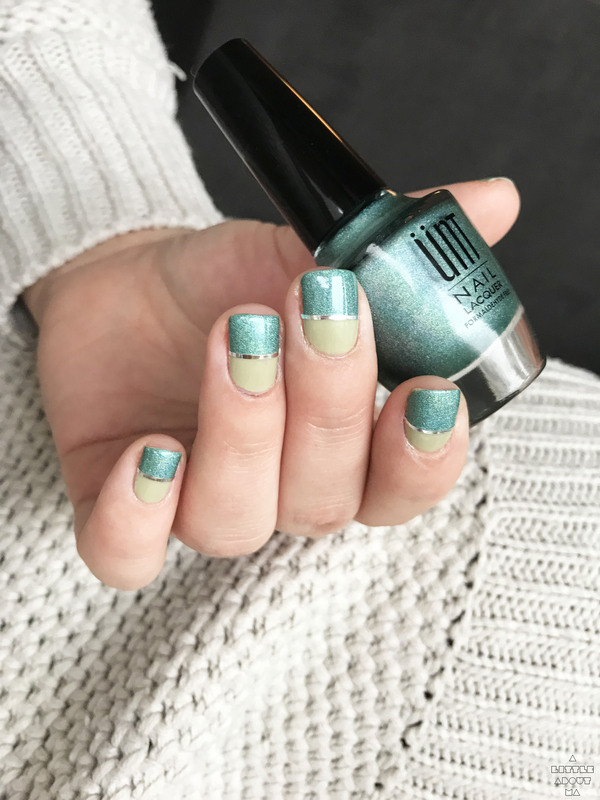 I photographed this on a day when we were having a blizzard and it perfectly matched the view from my window, with snowflakes glimmering in the streetlights. 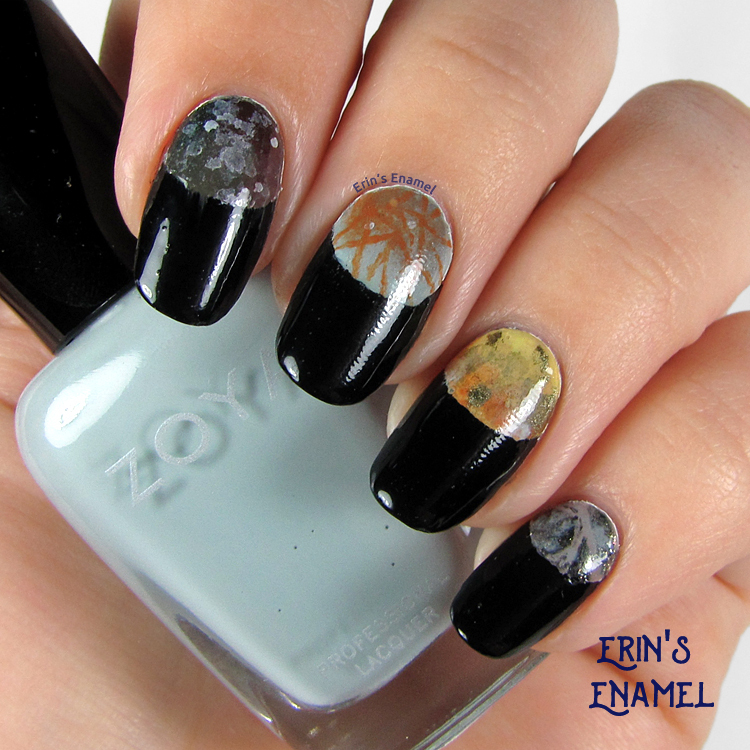 The effect is created with a nice balance of holo microglitter, holo shimmer, and a white jelly base. 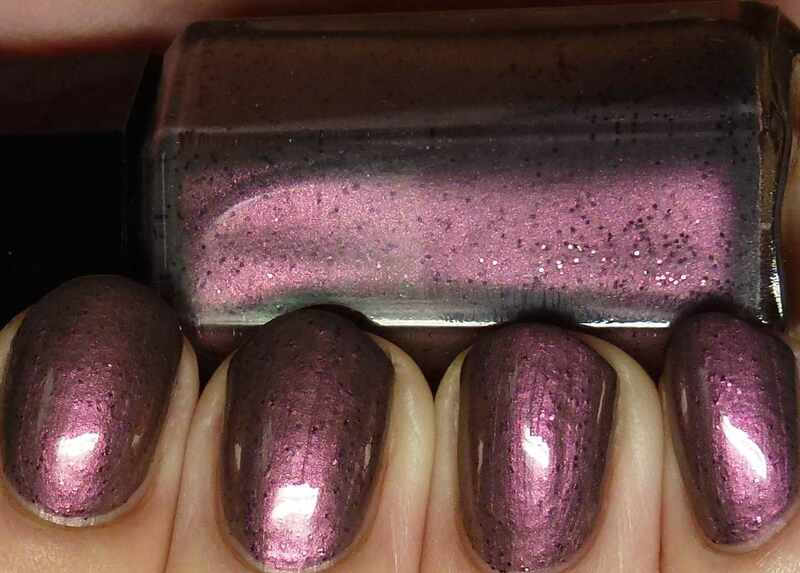 This is four thin coats again, and as you can see it is perfectly opaque and not streaky. 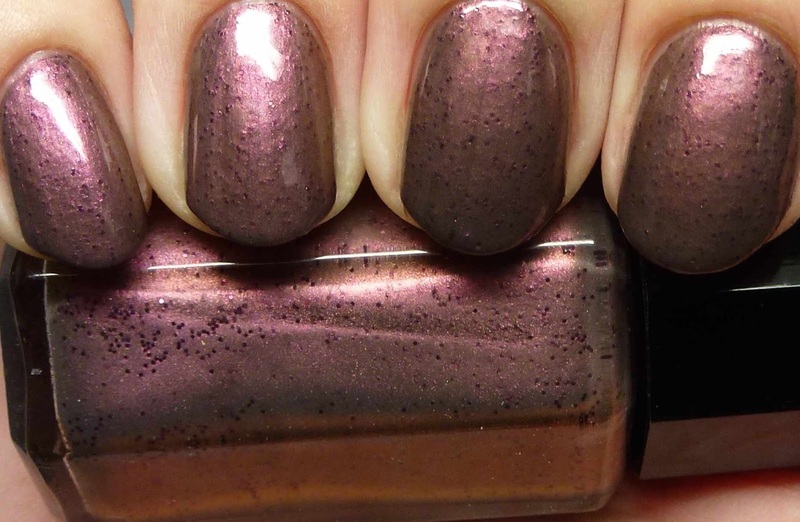 Sugar Plum Fairy is another shade that works on its own or as a topper. 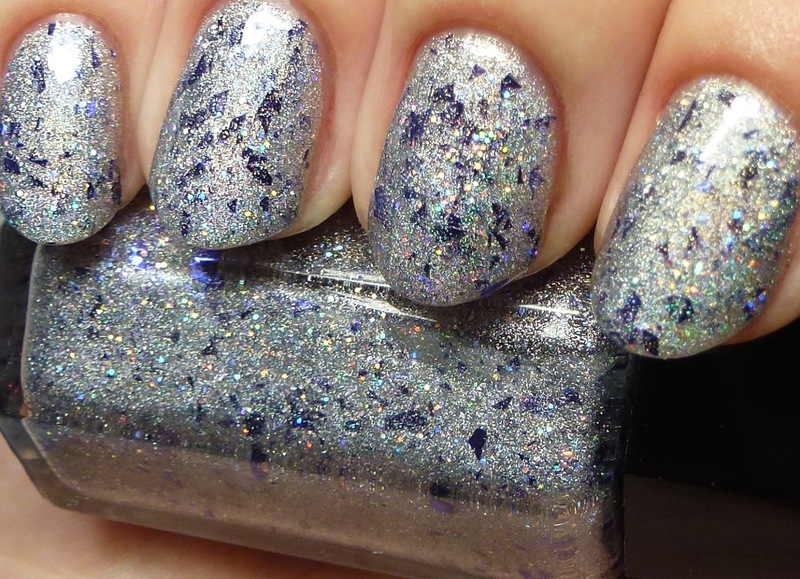 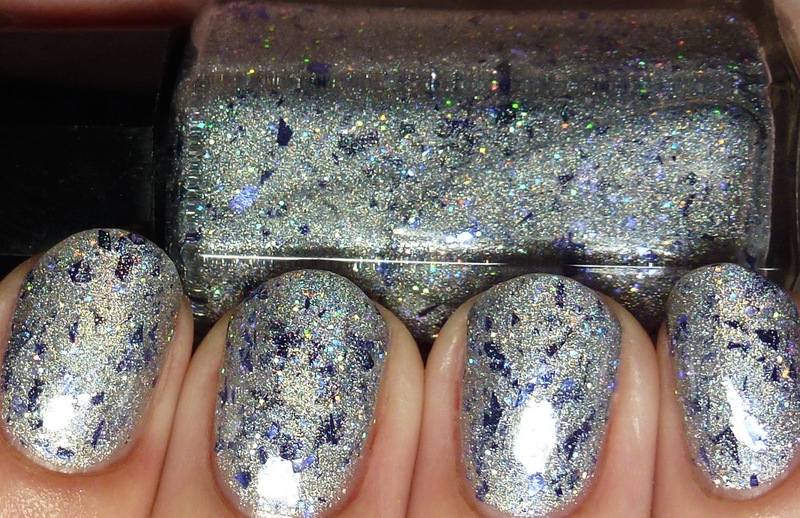 This reminds me of Hanukkah, with deep indigo shard glitter, holo microglitter, and lots of holo shimmer. 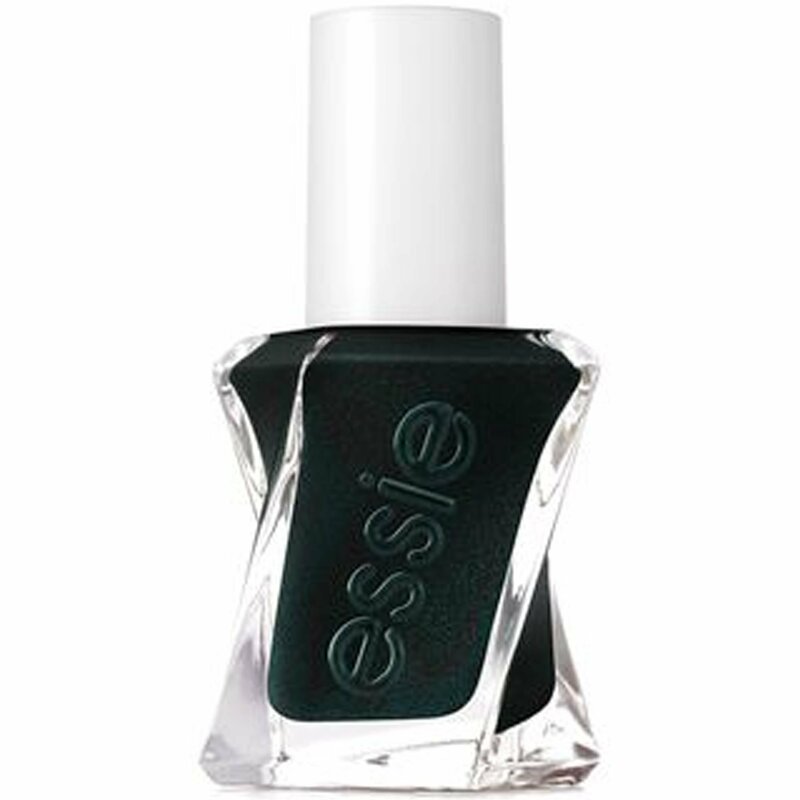 I am wearing it with four thin coats and topcoat. 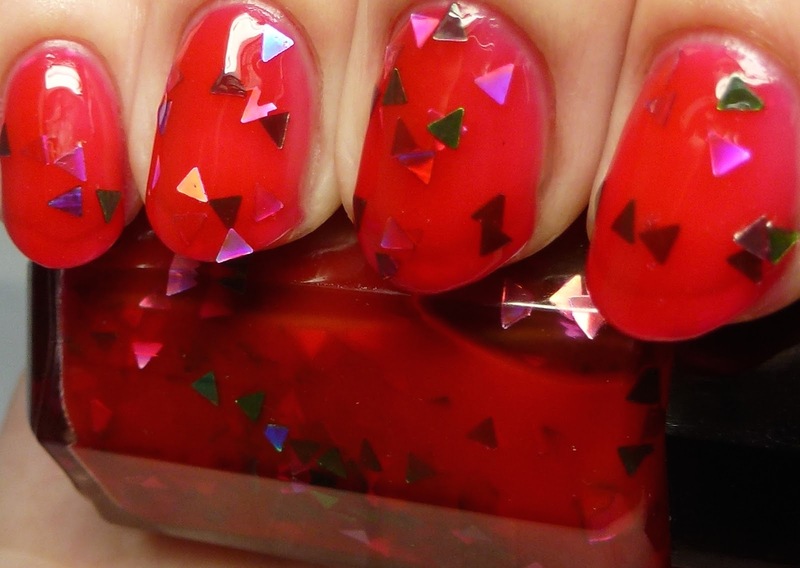 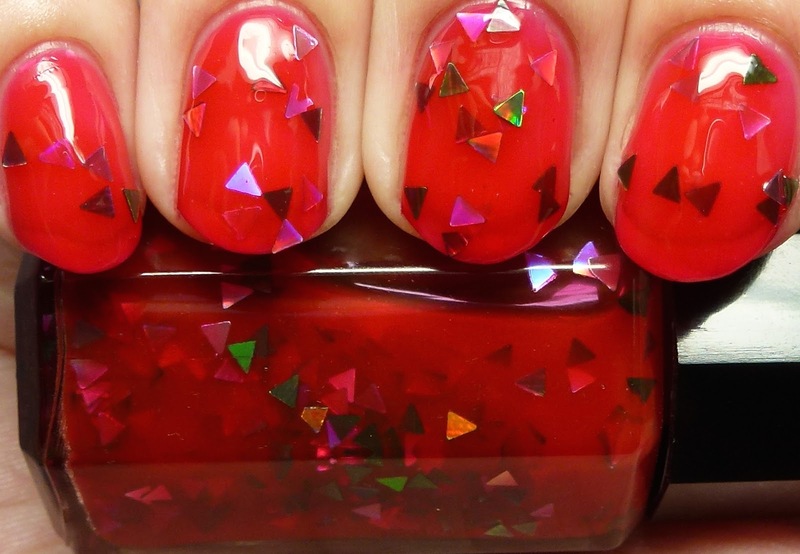 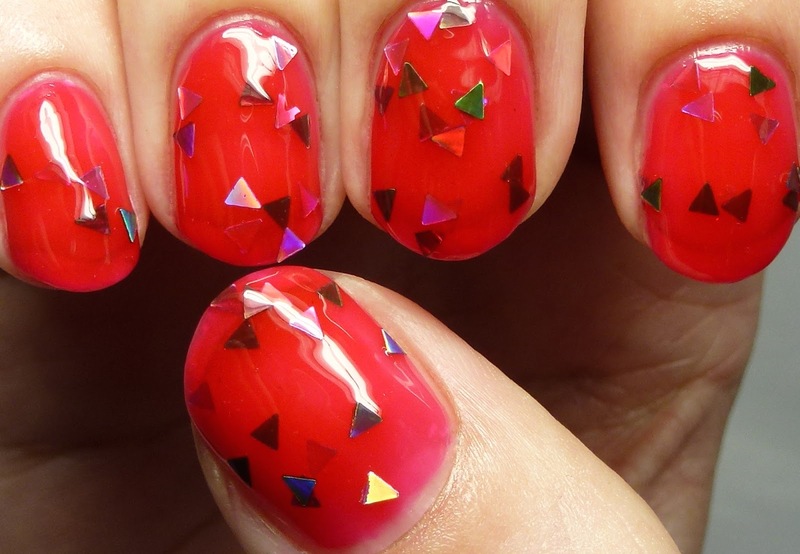 Tree Farm features silver and green holo triangle glitter in a red jelly base. 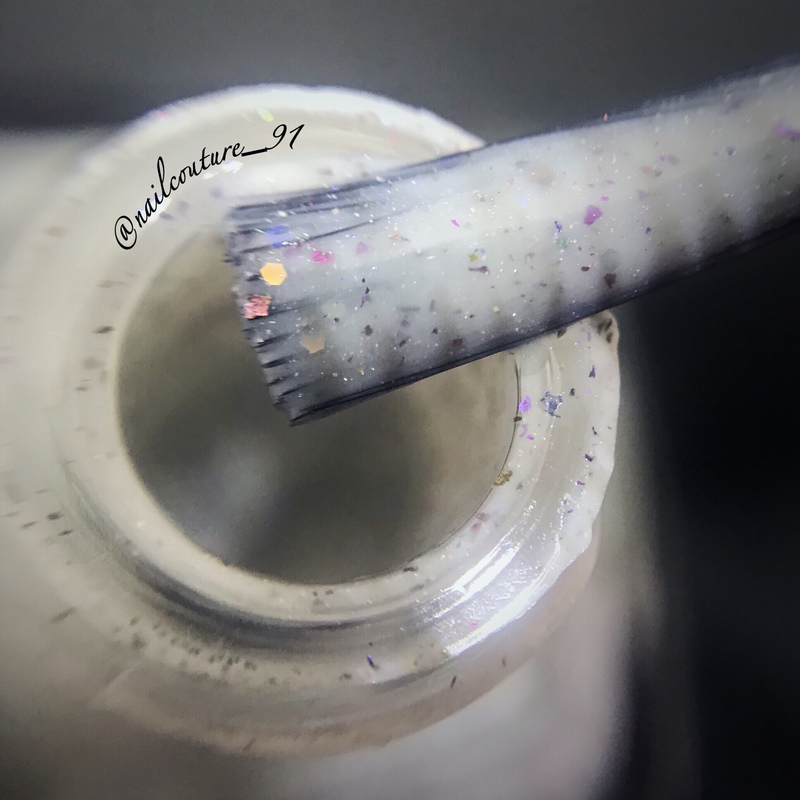 I photographed it with four coats on its own but it also works as a topper. 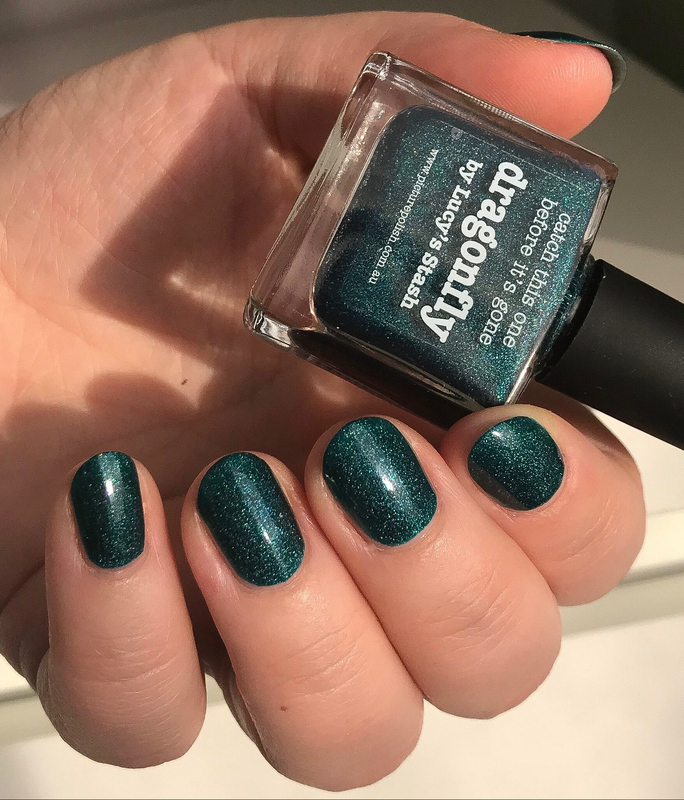 I didn't make any special effort to place the glitter, but did put the bottle upside down for a while before I painted it on, so I could get more of the triangle glitters out. 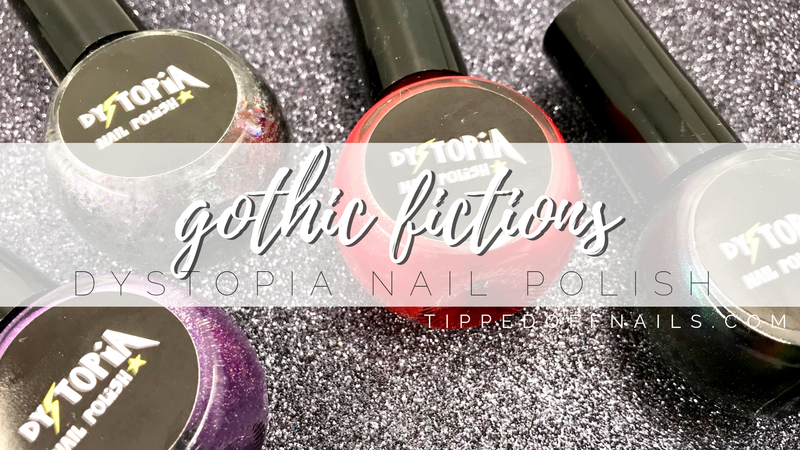 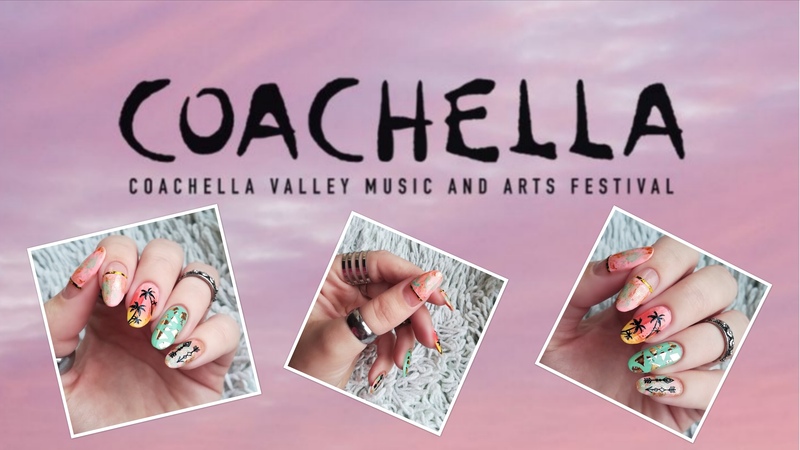 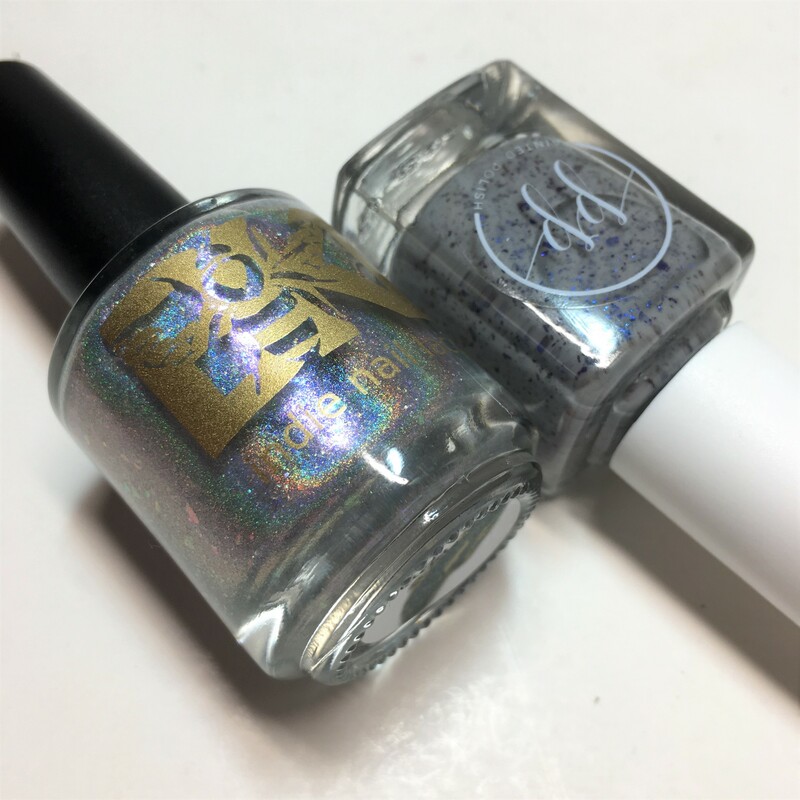 I've noticed that they are among the heavier glitters and have done the same thing with all the polishes I have tried with them included. 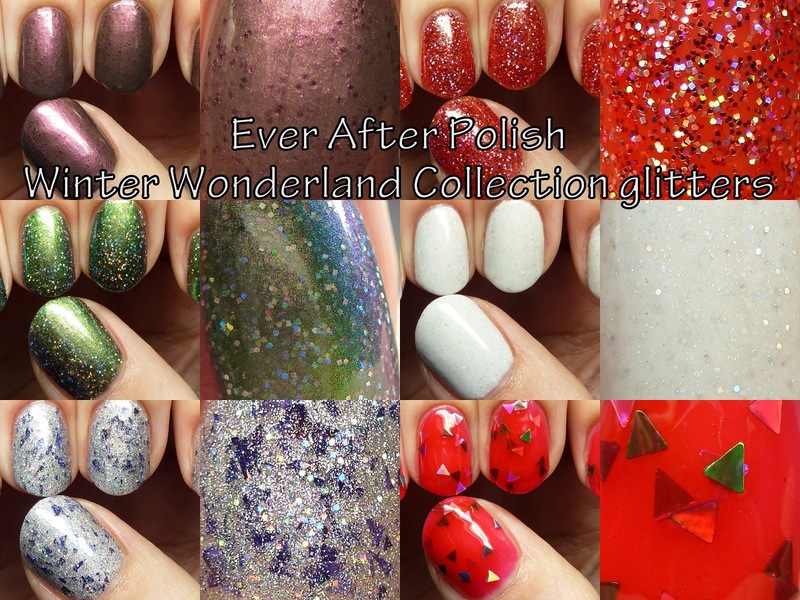 Ever After Polish is also running some holiday sale specials. 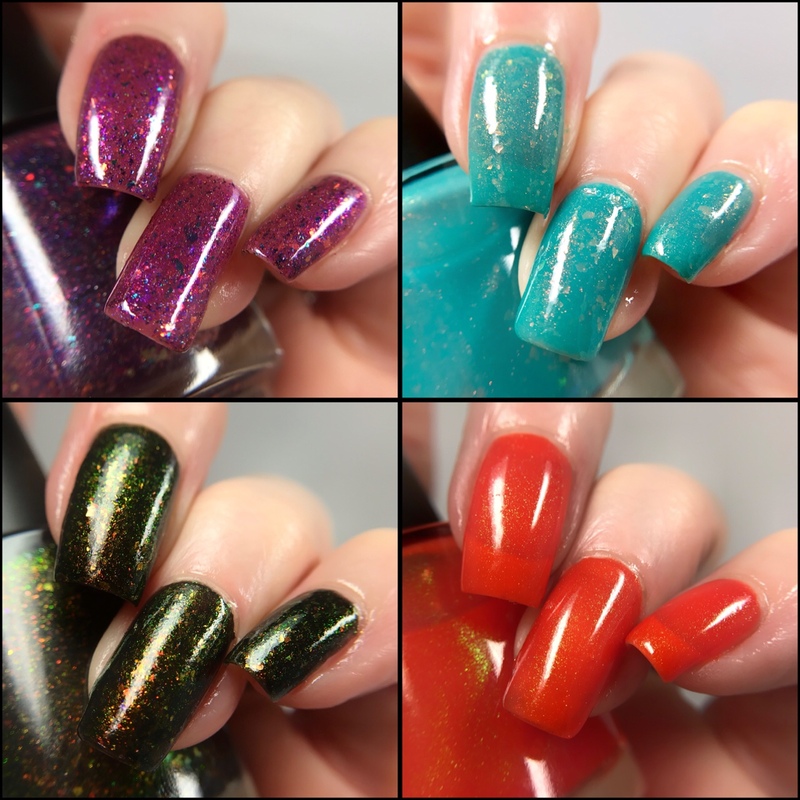 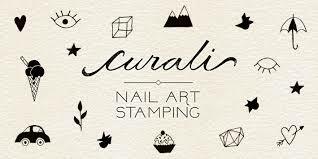 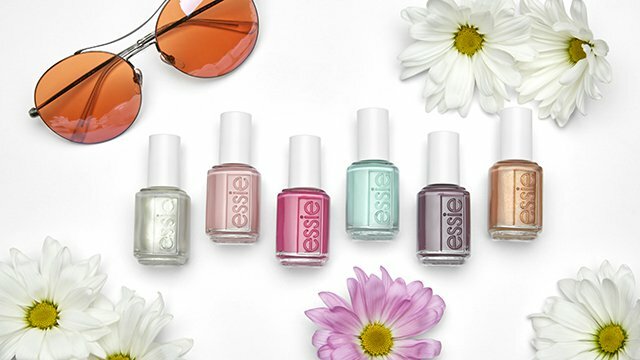 Code FRIDAYFUN20 will get you 20% off starting at the time of the launch, 11/29 at 12AM EST, plus a free mystery polish with purchase of three other polishes. 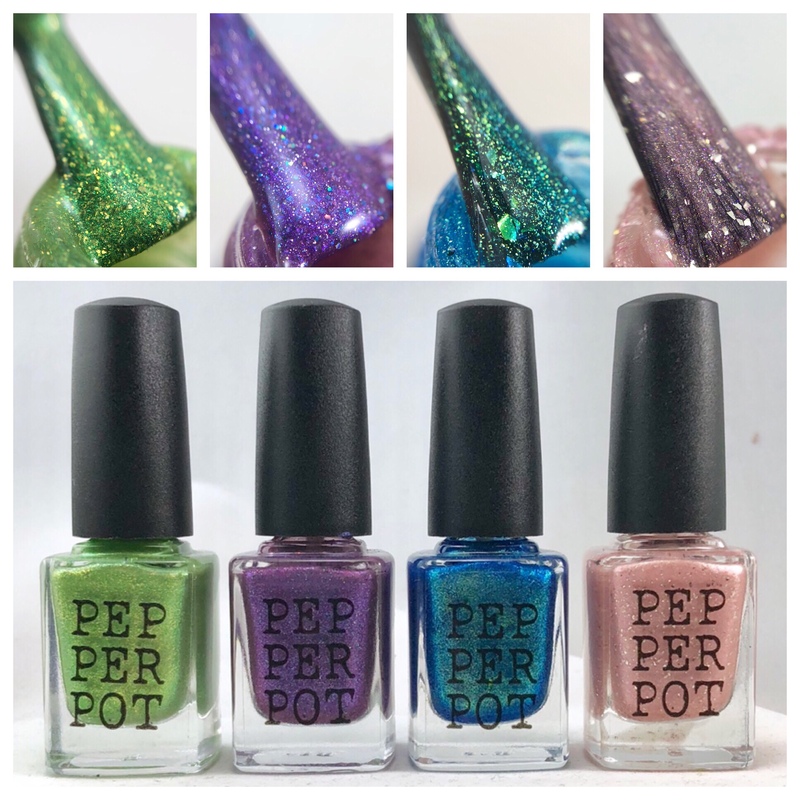 Saturday through Monday you can take 15% off with code STOCKINGSTUFF. 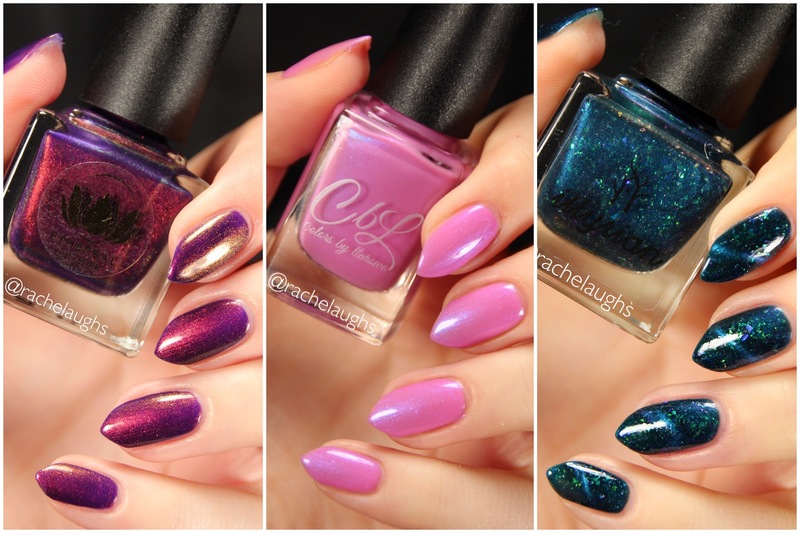 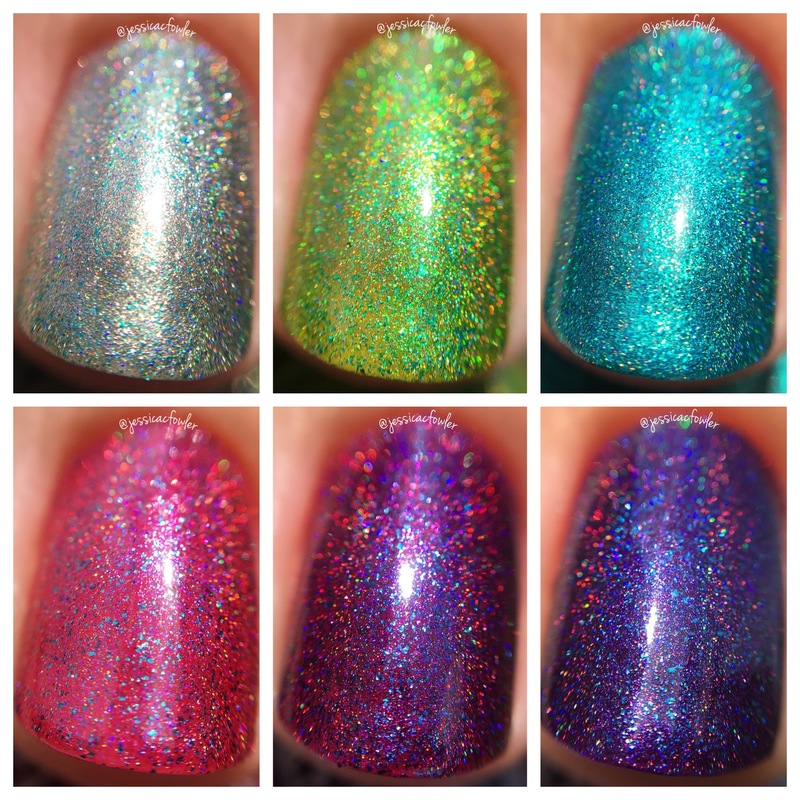 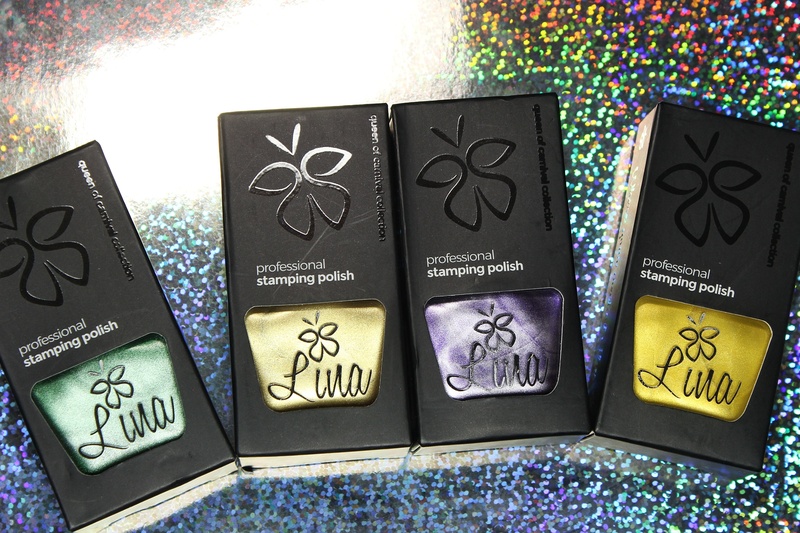 Also, have a look at my post on the creme, shimmer, and holo finishes in this collection! 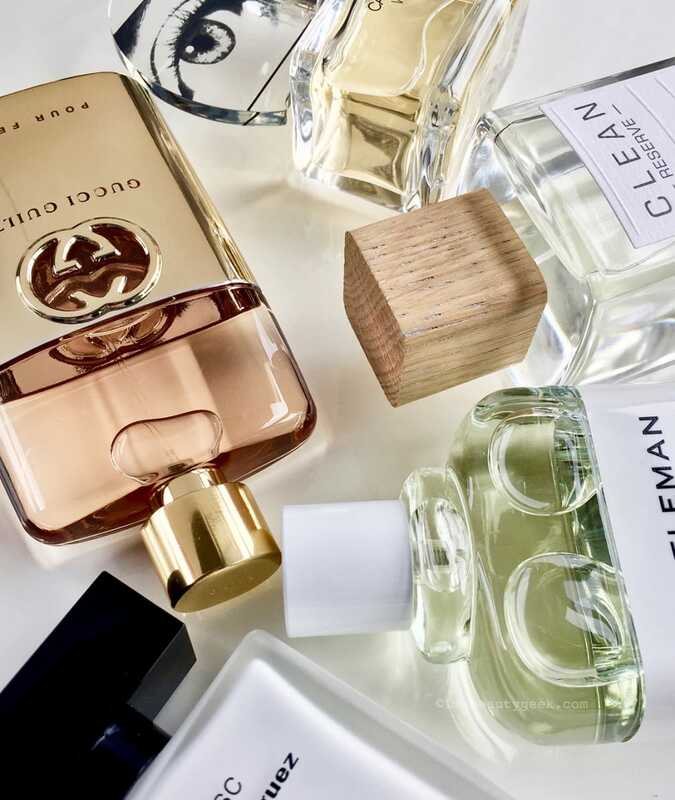 See anything you might want to pick up?